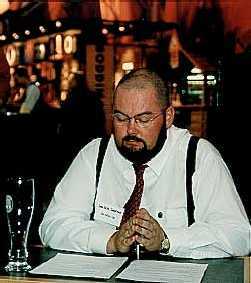 Jan-Erik Svensson, of Stockholm, Sweden is active in the Svenska Ölfrämjandet the Swedish Beer Consumers Organization and was the editor of their magazine, Maltesen in the early 1990's. He has been a main judge at the Swedish Homebrewers Festival since 1989 and at the Stockholm Beer & Whisky Festival since 1994.Jan-Erik	has taught beer at the universities of Grythyttan and Umeå. He is the author of the book Ölkunskap (Beer Knowledge) and has written hundreds of articles on beer for Swedish newspapers and magazines. He has arranged commercial beer trips to many of the important beer regions of Europe, including Franconia. Last spring, I and a dozen of other Swedish beer-lovers made a trip to some of the most interesting brewing sites in Franconia and Bavaria. Originally, I promised Fred to write an extensive essay. But more than a year later I realize it will never happen. Nevertheless, here is a brief report about the beers we sampled. After Landing in Frankfurt at noon, we entered our bus and headed eastwards into Franconia. Our first stop was a lunch at Bayer Bräu in Rothenfels/Main – the smallest town in Bavaria. As half-timbered as expected underneath a medieval castle. The brewery pub is Franconian standard, but there is a selection of different brands to sample. Bayer Bräu Schwarze Rose (3) is a Schwarzbier served om draught, soft with some butter and chocolate. The aftertaste is more roasty and bitter. Bayer Bräu Pils (3) is a straigtforward, German Pils with a hoppy bite and a greenish aroma. Bayer Bräu Märzen (3) was what most of the locals drank. Rounded, malty, very clean and a little bland. Bayer Bräu Bayerator (3) is a botteled Doppelbock with a huge, soft and sweetish taste balanced with a hint of hops. Bayer Bräu helles Hefeweißbier (2) is too thin and acidic for my taste. Bayer Bräu dunklesHefeweißbier (2) is even harsher than the paler brother. We followed the Autobahn to the vicinity of Schlüsselfeld, where the real beer country begins. On our way to Bamberg, we made a few stops, beginning at the attractive Sternbräu in Elsendorf. Sternbräu Hell (4) has a soft, malty and rounded base augmented by loads of hops. Typically Franconian with a balance between sweetish malt and intense bitterness. Decoction. Sternbräu Dunkel (4) has more of chocolate and a lower bitterness. Some butter. Two thirds of the malt is dark Munich. Decoction. Sternbräu Pils (3) is unfiltered and made from an infusion mash. Tangy but not as good as the other beers. The basic recipe is simple decoction with fermentation beginning at 6ºC an lagering times up to six weeks. In nearby Possenfelden we visited Scheubel, a minor gem once you have entered. Scheubel Pils (4) is made from a double decoction mash and is lagered for eight weeks. It is hopped with a mix of Hallertau and the nobler Tettnang varieties. Soft, round and clean maltiness with an intense but very aromatic hoppiness. A very good classic Pilsener with all the Franconian virtues. In Mönchsambach, the Zehendner brewery had a Maibockfest. Jolly and boozy and a good opportunity to sample different brands. Zehendner Maibock (4) is, of course, malty, but also surprisingly bitter with a harsh aftertaste. Zehendner Hefeweizen (4) has an almost Bavarian character with a soft, dense taste and a lot of bananas in the nose. Zehendner Lager (4) is very clean and dry with that rural, harsh house character. Finally in Bamberg, we visited some of the classic breweries. Some of us began above the old town at Greifenklau, walking downhill to our hotel Zum Goldenen Anker nearby the river Regnitz. Greifenklau Weizen (3) has the typical banana nose, but why wheat beer in Franconia? Greifenklaubier (3) is the standard lager of the brewery, with a murky yellow colour. The beer often varies in quality, and this time there was a lot of butter in the nose. Down by the river, we continued at Klosterbräu. Klosterbräu Bamberger Gold Pils (3) has some creamy, clean and hoppy Franconian qualities, but it is also very fizzy. Klosterbräu Braunbier (3) is a kind of unsophisticated Märzen with hints of chocolate. Klosterbräu Schwärzla (4) has retained the classic Schwarzbier taste – mild, roasty and very soft. Not so schlank as often today. More like in the bad old days, when the style flourished behind the iron curtain. Klosterbräu Maibock (1) was overwhelmingly phenolic and should perhaps not have been served. Klosterbräu Weizen (3) is thin and soft with some banana fruitiness. Schlenkerla was our last – and best! – stop before going to bed. Aecht Schlenkerla Rauchbier Märzen (5) is a real world classic. A powerful, brown Rauchbier, surprisingly clean and refreshing and – above all – very good balanced. Some beer-lovers find it to smoky, but they shall be forgiven. The perfect nightcap. Since we stayed two nights in Bamberg, the group was scattered in various fractions during the day. Some five of us rented bikes and went for a ride. We aimed to visit some old favourites, and it turned out to be a very memorable day. Our first stop was at Sippel in Baunach, one of my favourite Franconian brewers. And the beer was as good as ever. Sippel Vollbier (5) has a light brown colour driving from 100 per cent Munich malt. It has a very clean and fresh aroma. The taste is light and elegant, with soft malt and excellent hops. You couldn’t do anything better in this beer. And when you love the beer, you love the pub. We continued to Ebing and the old-world Schwanen-Bräu brewery, run by Mrs Hübner. Schwanen-Bräu dunkles Vollbier (4) is how I think that the original Munich lager could have tasted in the era of Sedlmayr and Pschorr. It is totally dominated by a dense, clean maltiness, but there is enough hops to make the beer balanced. Dark chocolate, some underlying sweetness. Hönig Lagerbier (4) from nearby Tiefenellern. A fresh Kellerbier in the classic mug. Dry, harsh and bitter with a simple, malty base. Very Franconian. In Breitengüssbach, we visited Hümmer and tasted their range of beers. Hümmer Pils (4) has a balance between butter and hops that is more Czech than Franconian. Hümmer Naturtrüb Urtyp (3) is mild, clean and simple with low bitterness. Hümmer Dunkel (3) has a hint of Schwarzbier character – roasty, sweetish and some hops – but it is not especially memorable. Hümmer Weizen (3) starts with a banana punch and continues with a pleasant, clean taste. In nearby Oberhaid, we went to the Wagner-Keller on a green slope above the Main valley. There we met the Franconian beer propagator and Bamberg resident Frank Wetzel, who turned out to be a very nice and friendly beer-lover giving us an inside view on the actual developement of Franconian beer. Wagner-Bräu Lagerbier (4) is very fresh and yeasty. The base is malty with some chocolate and coffee, but the bitterness evovlves throughout the mug and makes the beer a pleasure. Wagner-Bräu Pils (3) surprisingly also has some coffee in the aroma, but as a whole, the beer is clean and harsh. Frank guided us back to Bamberg, where we returned the bikes and then visited the rest of the classic breweries. During the evening, we stubled upon other members of our group. We started at Spezial, the perhaps most classic of all Bamberg breweries. Spezial Rauchbier Lager (5) is as clean, soft and good as you can demand. Much lighter in smoke than the Märzen from Schlenkerla, it can be downed in surprising quantities. Spezial Rauchbier Märzen (4) is much heavier, more like Schlenkerla but not as elegant. Spezial Weisse (3) is a lightish wheat beer with some bananas. Who drinks this at Spezial? We continued to Fässla on the other side of Obere Königstrasse. Fässla Pils (3) has a balance between juicy malt and a quite raw bitterness. Fässla Lager (3) is a pale brown Vollbier with smooth caramel taste and some balancing but harsh hops. Fässla Zwergla (3) is a heavier Märzen cousin to the lager. Grain and caramel with an adstringent aftertaste. A short walk eastwards took us to the Maisel pub Bamberger Weissbierhaus. Maisel Pils (3) has a green, short taste of the all-German Einheitsbier type. Maisel Kellerbier (4) is neutral and refreshing. Maisel Benediktiner Dunkel (3) has a light and clean taste with some chocolate and sweetish cream. Maisel Weizen (3) is soft and thin with more phenols than bananas in the nose. After a long walk to the suburb of Wunderburg, we visited the local Keesmann and Mahrs-Bräu breweries. Keesmann Hell (3) is a simple beer with the typical house character reminding of juicy tobacco. Keesmann Herren Pils (3) is rather similar, perhaps a little more tasty but with less balance. Keesmann Sternla Lager (3) has a much more traditional touch, but there are a lot of more characterful beers in similar style. Keesmann Weizen (3) is far too thin but has some tobacco and bananas in the nose. Keesmann Bock (4) has the taste you expect when ordering a Bock. A lot of muscles with a juicy, sweetish malt aroma. Mahrs-Bräu has a classic old-style tap room but also some good beers. Mahrs-Bräu U (4) is a chocolate-tasting Franconian-style beer with low carbonation and fresh hoppiness. Mahrs-Bräu Hell (4) is my favourite Bamberg blonde. A simple pale beer in Bavarian style. Mahrs-Bräu Pils (3) has more butter and hops. Mahrs-Bräu Weizen (3) is thinnish but pleasant with some bananas. Mahrs-Bräu Bock (4) has a powerful and interesting basic character reminding of sweetish rye bread. Astonishing bitterness in the aftertaste. On the way back to the hotel, we made a stop at El Niu, formerly Bürgerbräustübla. Today a Catalan restaurant with white tablecloths and very few guests, the staff was a little astonished when some eight red-nosed Swedes entered and ordered beer only. Kaiserdom Pils (3) is very pale in colour and taste. Very low bitterness, some butter. Kaiserdom Kellerbier (3) is light and neutral with a little chocolate. Kaiserdom Weizen (3) is soft, thin and neutral. Aecht Schlenkerla Rauchbier Märzen (5) was as good as yesterday and ever. Most of the day we spent in Oberpfalz, a Bavarian-speaking region squeezed between Franconia and the Czech border. The local speciality is a beer called Zoigl. It is brewed at five still-existing municipal brewhouses and then fermented at people’s homes. Some of the families have the right to serve their beer, and we managed to taste Zoigl from all five breweries and one day. I don’t think that anyone else has managed to do that. Zoigl is usually a brown lager and in many respect similar to the traditional beers of Franconia. But we had our first beer in Franconia, at Schnupp in Altdrossenfeld near Bayreuth. Schnupp Vollbier-Hell (3) has a soft, clean, neutral and refreshing taste of Einheitsbier character. Schnupp Edelpilsner (3) is light and very soft but more sweet than bitter. Schnupp Altfränkisch Dunkel (3) could have been more interesting, but a slight infection effectively covered the more subtle virtues of the beer. Falter Weissbier (3) from Hof in eastern Franconia. Thin, grainy and a little citric. We tasted our first Zoigl in Falkenberg, a Dracula-style village with a small municipal brewery and only one Zoiglwirt – Zoiglstube Kramer. Falkenberger Zoigl (5) hit me like an arrow into the heart. I instantly fell in love with this round, clean, soft and malty beer with a hoppiness that is both raw and aromatic. And the Stube is as far away as you can get from Hofbräuhaus in Munich. The next stop was at the family-owned brewery Riedl in Plössberg. Riedl Vollbier Hell (3) is a soft and clean but tasty Helles. Riedl Pils (4) has hints of neighbouring Bohemia in the balance between butter and hops. Riedl Märzen (4) is much heavier, with a very good maltiness and a powerful balancing bitterness. Riedl Zoigl (3) is no real Zoigl, but made in a similar style. Butter, chocolate and not enough hops. Riedl Bock (4) is the classic rural Bock with huge but soft and clean malt. Very low bitterness. In the town of Weiden we had lunch at the new micro-brewery Bräuwirt. Unfiltered modern interpretations of classic beer styles. Bräuwirt Hell (4) is soft, clean and sweet with some balancing bitterness. Bräuwirt Dunkel (4) has a taste of dark, unfermented wort and a very low bitterness. Bräuwirt Weizen (4) is a perfect wheat beer that could have been a little fuller in body. While searching for beer from Gambrinus – the major brewer in Weiden – is asked the locals where the best beer in town is served. I was guided to the attractive old-style pub Hennerlock and tasted three different beers from Scherdel in Franconian Hof. Scherdel Hell (4) is a very good Helles with balance between clean malt and fresh hops. Scherdel Pils (3) has more bitterness but less colour and charachter. Scherdel Weizen (3) is packed with fruit but lacks the phenolic balance of the best wheat beers. The next Zoigl-village was Eslarn at the Czech border, where we visited Zoigl-Stum Beim Stroehern. Eslarner Zoigl (3) is a little phenolic and could also have been more hoppy. It is fermented in 10-14 days and then lagered at high temperatures (7-8ºC!) for a month. Beim Stroehern takes the yeast from the commercial Bauriedl brewer in the village. The beers from Bauriedl are among the mildest that I’ve ever tasted in Europe. Bauriedl Hell (4) is almost American in its delicate and clean character. Very low bitterness, but also very refreshing. Bauriedl Eslarner Edel-Pils (3) is a straightforward and simple Pils. Bauriedl Eslarner Hefe-Weizen (4) is very fizzy, fruity and mild. A very good wheat beer in the elegant Huber-like style. Next stop was at Scheurer in Moosbach with a gigantic range of different brands. Scheurer Moosbacher Classic Gold (4) is an excelleent beer hard to define into any of the standard categories. Golden, clean and very hoppy. Scheurer Moosbacher Lager Hell (3) on the contrary is a standard Helles. Scheurer Moosbacher Pilsener (4) is similar to Classic Gold with slightly less character. Scheurer Moosbacher Leichte Weisse (2) is very thin and light as low-calory beers use to be. Scheurer 3 Korn-Weisse (3) has a neutral wheat-beer taste and is made from a mix of wheat, rye and spelt. Scheurer Festliches Exportbier (3) is a juicy, low-attenuated brew with powerful maltiness. Scheurer Weissbier (4) has a clean and soft taste with banana in the nose. Scheurer EdelWeisse (3) is similar to the ordinary wheat beer but thinner. Scheurer Alt Kellerbier (3) is not as interesting as it sounds. Some rye-bread and coffee but far too low bitterness. Scheurer Zünftige Schwarze (3) is a thin, acidic dark wheat beer with more phenols than fruit. Oberpfalz has its own wheat beer tradition. It differs from the Bavarian in Flemish direction. The only place where it is brewed today is at the Behringer brewery in Vohenstrauss. The beer is served with a slice of lemon in earthenware mugs with tin lids. Charming beer and a lovely old-style pub. Behringer Weizen (4) is a minor classic. The beer is only moderately chilled and the carbonation is low. The taste is light and fresh with some appetizing acidity. The rest of the day we concentrated on Zoigl, starting in Mitterteich. This particular day there was no tap-room open to the public, but we could sample the beer from the Oppl family at a local party in the town’s ice-hockey arena. Oppl Zoigl (5) is an amber beer with unique qualities, equalling the best Franconian lagers. Absolutely clean nose with both malt and hops. Soft, round and light taste with intense and fresh hops. Elegance is the key word. We continued to Neuhaus/Waldnaab and tasted the local Zoigl served at Schafferhof. Schafferhof-Zoigl (4) is surprisingly dry and bitter, reminding of a good classic Pils. In neighbouring Windischeschenbach we stayed overnight at the Zum Weissen Schwan hotel. Together with Neuhaus there are 14 different Zoigl tap-rooms in Windischeschenbach. There are two separate breweries – one in Neuhaus and one in Windischeschenbach. This evening four tap-rooms were open, all within a hundred meters from the hotel, where we started. Zum Weissen Schwan Zoigl (4) is among the fullest, a really satisfying beer. It could be more hoppy. Fiedlschneider Zoigl (5) on the contrary is lighter and more balanced in the style of Falkenberg and Mitterteich. Clean with a round maltiness and a very raw and fresh bitterness. And very jolly too at Martin Sperber’s tap-room – after all, it was Saturday evening. Da Roude Zoigl (4) is fuller in body and less hoppy than Fiedlschneider. Nevertheless quite elegant and very drinkable. The final Zoigl was downed at a hotel called Oberpfälzer Hof. Oberpfälzer Hof Zoigl (4) combines butter with hops. The diacetyl shouldn’t be there, but if you can stand it, the beer is good. Falkenberg, Eslarn, Mitterteich, Neuhaus/Waldnaab and Windischeschenbach should be recognized as really unique brewing sites, combining medieval traditions with lagers as traditional as can be. But there are a couple of municipal breweries in Franconia too. The one in Sesslach, north of Bamberg, is perhaps most well-known. But there is one in Neuhaus/Pegnitz in eastern Franconia too. Even if the Franconians never uses the name Zoigl, the tradition is very similar. In Neuhaus there are four families serving the local brew at different times. Döth Märzen (4) is a clean, mighty and very creamy, low-attenuated beer with light brown colour. The massive malt is balanced with enough hops. Some adstringence in the aftertaste. Our next stop was in picturesque Pottenstein with two breweries famous for their black limestone lager. Both breweries are in the half-timbered main street underneath cliffs and castle. Disney couldn’t have made it better. Mager Dunkel (4) has a massive, dry chocolate character in borth nose and palate. Very drinkable without beeing too sweet. Hufeisen Urdunkel (4) is cloudy and more roasted, reminding of coffee or stout, combined with both sweetness and hops. In the Franconian heartland we visited a handful of breweries on our way to the Hallerndorfer Kreuzbergfest, starting at Först in Drügendorf. Goldener Löwe Lagerbier (3) is pale brown with a rounded malty taste and some hops, but unfortunately also some apples. Goldener Löwe Premium Hell (3) is much more neutral. Goldener Löwe Pils (3) has the same kind of cardboard-apple faults as the Lagerbier. Goldener Löwe Export (2) is really too much, lacking any freshness. At Pfister in Weigelshofen the beers were more neutral. Pfister Landbier Hell (3) is very clean, mild and soft. Pfister Weizen (3) is a light and dryish wheat beer. Pfister Kellerbier (4) has a clean chocolate character but too low bitterness to make it really balanced. In Eggolsheim, we tasted the beers from Schwarzes Kreuz at the Keller outside the village. Modern Germany feels very far away here. Schwarzes Kreuz Kellerbier (4) has a soft malt base disturbed by both diacethyl and phenols. Nevertheless, the beer was better at the bottom of the mug – perhaps because of the atmosphere? We had a much nobler experience at a similar Keller outside Schlammersdorf. Witzgall Lagerbier (5) is the perfect Franconian summer beer – light, clean, high-attenuated and very hoppy. Especially the hop character is very noteworthy. Finally we reached Hallerndorfer Kreuzberg, where three different brewers have their Kellers in the forest. This is a Franconian classic, especially when you manage to get there during the Kreuzbergfest. Which we did. Lieberth Kellerbier (5) from Hallerndorf is really more like a good Pils with its uncomplicated, fresh and hoppy character. Rittmayer Kellerbier (5) from another Hallerndorf brewery is even drier but also more aromatic with a hint of grapefruit in the intense hoppiness. Almost American style. Friedel Kellerbier (5) from Schnaid was this year’s best choice att the Kreuzbergfest. Soft, roasted malt and a very elegant hop finish. Very Franconian indeed. Rittmayer Kellerbier (3) is refreshingly dry but perhaps a little too adstringent. In Aisch, we found the third Rittmayer brewer in this area. Rittmayer Vollbier (3) has a nice dark yellow colour. The taste is very clean and neutral with low bitterness. We stayed overnight at Bayerischer Hof in hop-growing Spalt – a nice little Franconian town – and had a taste of the local beers before going to bed. Spalter Hopfen Leicht (2) has the boiled taste of many European low-alcolol lagers. Spalter Vollbier Hell (3) is soft, malty and clean with some dissapointingly simple hoppiness in the finish. Spalter Pils (3) is even more dull. We expected a real hop-bomb, but unfortunately this is an Einheitsbier. Spalter Edel-Export Dunkel (3) from bottle is soft and sweetish, but there are som hops in the finish. Spalter Weisse (3) in a lighter interpretation of the style is one of the finest beers from this brewery. We also tasted a dark wheat beer from neighbouring Pyras. Pyraser Jubel-Weisse Altfränkisch (3) is a thinnish brew with some coffee. Hübner Vollbier (3) from Steinfeld in Franconia. Pale brown, very nice malt character with bread and vanilla, a little too low hops. Our first Bavarian stop was in Maisach west of Munich. Maisach Hell (3) is full-bodied and clean with low hoppiness. Very Bavarian. Maisach Kellerbier (3) has a mock-Franconian touch (served in a pewter mug), but seems to be an unfiltered version of the normal pale lager. A little more yeast and hops. Maisach Räuber Kniessl Dunkel (4) has all the malty virtues of a good Bavarian dark lager. Very nice, sweetish rye-bread aroma. Surprisingly hoppy, which makes the beer even more drinkable. Maisach Weizen (4) is a soft and simple wheat beer with bananas, light acidity and some phenols. Maisach Pils (2) unfortunaly was infected and presented an unpleasant mix of butter, vinegar and hops. At the shore of lake Ammersee, we had lunch at a new micro-brewery at Mühlfeld. Mühlfeld-Bräu Hell (3) is full-bodied and clean with low bitterness. Made according to the book, but could have more personality. Mühlfeld-Bräu Dunkel (4) has a very dark colour and is very sweet. Czech-style chocolate and butter. Mühlfeld-Bräu Weizen (3) has the same schoolbook example qualities as the pale lager. Beautiful orange colour. A few kilometres away, we visited the charming tourist trap monastery brewery at Andechs. Andechser Spezial Hell (3) is massive and malty. High attenuation and some hops gives a dry finish. The sulphur so common to many German beers is a little too evident. Andechser Doppelbock Dunkel (5) is a Bavarain classic made from a triple-decoction mash. Very dark, very malty, very sweet. Liquid bread due to a low attenuation. No sulphur or other faults. Andechser Weissbier Hell (4) has a dense banana-and-nutmeg aroma, a very soft wheat taste and balancing phenols. In the bus, we continued with som bottled products purchased at a Getränkemarkt in Maisach. Augustiner-Bräu Maximator (4) from Munich is roughly in the same style as the double bock from Andechs, but this bottled version seemed a little bland in comparison. Augustiner Lagerbier Hell (3) is very soft and malty with very low bitterness. The Carlsberg of Munich. Some sulphur. Closer to the Alps, we made a stop at Klosterbrauerei Reutberg outside Sachsenkam. Reutberger Josefi-Bock (5) is the best Bock that I’ve ever tasted. With an original gravity of 17% Plato and an ABV close to seven percent it is one of the strongest ”simple” Bocks. Beautiful pale brown colour. Massive, concentrated aroma where the clean malt dominates and the hops give balance. No disturbing ethanol. High attenuation. The noble hop character is especially noteworthy in a malty beer like this. Reutberger Weizen (3) has a soft and drinkable character where the bananas dominate. Reutberger Hell (4) is absolutely free from sulphur in the nose. The malt plays the first fiddle. Soft and clean with low bitterness. Reutberger Dunkel (3) is lighter in character, combing dark bread maltiness with a roasty tang. Even closer to the mountains, we visited the tourist resort of Tegernsee with a famous beer-hall well worth visiting. Tegernseer Hell (3) is a standard Bavarian pale – soft and neutral with some sulphur. Tegernseer Spezial (4) is the premium brew, more malty and surprisingly hoppy. Very drinkable and satisfying. Tegernseer Dunkel (3) has some bitter chocolate but lacks the power of a great beer. We stayed overnight at Zierer Stuben in Hausham. Our host had a collection of bottled beers from Oberbräu in Holzkirchen. Oberbräu Hell (3) is a standard Bavarian pale lager in the Reinheitsgebot Carlsberg style. Oberbräu Pils (3) has less colour but more hops, as it should be. Oberbräu Weizen Hell (3) has a satisfying fizz and a mild taste with some bananas. Oberbräu Weizen Dunkel (3) has less wheat beer character, which often is the case with the darker brands. Oberbräu Dunkel (3) is as bland as the pale lager, of course with a hint of dark malt. Ettaler Curator (4) from Klosterbrauerei in Ettal is a high-attenuated double bock with bready malt in the aroma. The reason why we chose Hausham as overnight stop, however, is Peter Auers brewery. Hausham Urtyp Märzen (5) is the best Märzen I’ve ever tasted. Dark amber colour. Dry malt taste combining elegance and a full body. Balancing, noble hops. I know of no other beer where you can taste the typical Bavarian maltiness as in this Märzen. It is also fuller in body than most of its counterparts. Hausham Weizen (3) has an overwhelming banana character and lacks balance. Hausham Hell (4) is a Helles with unusual qualities. Clean (no sulphur! ), full and soft with a good hop finish. Today, we turned our back to the Alps and continued into the wheat beer land along the Inn river. We started in Miesbach. Hopf Weisse Hell (3) is soft and clean with some acidity. Hopf Weisse Dunkel (3) is quite similar but with less wheat beer character. Hopf Weisse Bock (3) is much bigger with some ethanol. Hopf is known to have introduced wheat beer on draught, which is not a very good idea according to my taste buds. They prefer the chunky, yeasty character that you get from the bottle. In the hamlet of Hermannsdorf, there is a new age yuppie brewery called Schweinsbräu. The local shop sells different types of luxury ecological stuff. And bottled beer. Schweinsbräu Hell (3) has a juicy maltiness with some adstringence. Schweinsbräu Weisse (3) has pleasant bananas in the nose but too much phenols in the taste. Schweinsbräu Dunkel (3) is dry and roasted but thinnish. Schweinsbräu Jubiläums-Trunk (3) is similar to the Dunkel but softer. Schweinsbräu Maibock (3) is soft, clean and neutral. Perhaps a little too much ethanol, but still one of the best beers from this brewery. Schweinsbräu Visionator (4) is really dark brown and has a softer taste than the may bock. The strongest beer is the best. Again. In the town Grafing, we visited the Grandauer pub. Formerly also a brewery, but today the Grandauer brands are brewed by the local Wildbräu brewery. Grandauer Hell (3) is fresh, simple and juicy but too dry in the aftertaste. Wildbräu Dunkel (3) lacks the taste of dark malt. Grandauer Helles Weissbier (3) is a neutral and simple but correct wheat beer. Grandauer Dunkles Weissbier (3) is a little too dry and lacks fruit in the nose. Wildbräu Pils (2) has virtually no bitterness, and the body is very thin. Some harshness in the aftertaste. Grandauer Schwarzbier (4) has some old-world qualities with a soft, clean, rounded and sweetish taste. Our next stop was a traditional Bavarian countryside estate called Forsting. They brew and serve their own beers in a large, refurbished pub, but we sat in the shady garden. Gut Forsting Weissbier Hell (3) is clean but a little too thin, with too much phenolic taste and too little fruit. Gut Forsting Export Dunkel (4) is almost black and has an unusually roasty taste. The body could have been fuller. Gut Forsting Export Hell (3) has the typical modern German Einheitsbier taste. Unertl gesünder Hefeweizen (4) from nearby Haag is the draught version of this well-known wheat beer. Traditionally brownish and cloudy, even if the beer is infusion mashed today. Soft and clean taste with some chocolate. We continued to Haag, where the famous blue-and-white pub unfortunately was closed. But we bought a selection of bottled beers at the brewery. Unertl Weissbier (4) is the bottled version of the brewery’s principal product. Very similar to the draught version. Soft chocolate, very yeasty, not so fruity. Unertl Erinnerungstrunk Ursud (4) is sweeter, stronger and maltier. Fresh nose with some acidity. Neutral and soft taste with low fruit. Unertl Weissbier Bock (4) is even stronger and darker. The house character is nevertheless the same. More nutmeg than banana. The phenols are hiding behind the alcohol. A relatively yummy brew. We had lunch in the brewing village of S:t Wolfgang. The experience was a little eclectic since the brewmaster was from Thuringia and the brewery’s former tap-room was transformed to a greek restaurant. Not so urbayerisch anymore, but greek food is good after days filled with pork and dumplings. And it goes very well with Einheitsbier. Wolfganger Hell (3) is bland and sweetish with some sulphur in the nose. Wolfganger Helles Weissbier (3) has a full body with a little caramel in the nose. Wolfganger Dunkles Weissbier (3) is brewed by Wildbräu in Grafing, and the beer is identical to Grandauer Dunkles Weissbier mentioned above. We had far more rewarding experiences at the Kammhuber brewey at the isolated farm of Stierberg in the middle of nowhere. Very well-made traditional lagers with the same type of soft, clean and malty taste as we found in Reutberg and Hausham. We were the only guests. Stierberger Eispils Monte Torro (3) should – according to the present Bavarian trend among teenagers – be consumed straight from the long-neck bottle. No wonder the Bavarian brewers have problems. This Bio Eis Pils is extremely pale, very light in body and very bitter. And surprisingly good. I assume that Monte Torro is meant to be Stierberg in Spanish. Stierberger Hochzeitsbier (4) on the contrary is a very traditional, unfiltered dark lager. Very roasty, tasty and full-bodied. Very low bitterness. Stierberger Export Hell (4) is a very good Bavarian pale lager. Well-attenuated but still malty and with satisfying hops in the aftertaste. Deliciously clean and characterful. Stierberger Märzen (4) is very malty. Soft with a hint of caramel. Very low bitterness. Very drinkable. I like the idea that all four Stierberger beers differ a lot in taste and character. Our next stop was at the Baumer brewery at the main square in the little town of Gars/Inn. Especially the bottled beers were very nice. Baumer Hell (3) was the only beer on tap. Light and simple with some sulphur. Baumer Märzen (4) has a very mild and clean malty taste. Very low bitterness. Baumer Dunkel (4) is very soft and sweet. A simple, traditional beer with low attenuation and very low bitterness. Baumer Weissbier (4) is a really good wheat beer with massive banana perfuming a full, malty body. Very satisfying. We continued at the nearby Kloster-Bräu Gassner in Au/Inn, famous for it’s well-preserved tap-room with an old world atmosphere. Kloster-Bräu Dunkel (4) is a modern dark lager with a clean body and a hint of café au lait. Very high degree of attenuation. Müllerbräu Hell (3) on tap is extremely soft and clean with some malt. Müllerbräu Dunkel (3) is very neutral with almost no taste of dark malt. Müllerbräu Bockser (4) is a sweetish, malty, clean and good bock. Müllerbräu Dunkles Weizen (3) has more colour than taste. Not bad, but too bland. Müllerbräu Pils (3) on tap is light and thin with too little hops. The most dissapointing beer from Müllerbräu. Müllerbräu Helles Weizen (4) on the contrary is the best choice. Creamy wheat-malt character and a strong banana bouquet. Not so full-bodied, still very characterful. Close to the famous chapel in Altötting we visited Altöttinger Hof, serving beers from the local Hell-Bräu brewery. Altöttinger Hell-Bräu Hell (4) is fresh, spritzy and malty with balancing hops in the aftertaste. Unusual for Bavarian standards, but far better than the bland standard lagers. Altöttinger Hell-Bräu Pils (3) is less fresh, but it is a clean beer with some bitterness. Altöttinger Hell-Bräu Weizen (4) has the nice combination of creamy wheat malt and bananas. Sweet, big taste. Altöttinger Bayrisch Dunkel (3) is clean and roasty but no big personality. Just outside the southern end of Altötting we stayed overnight at Graminger Weissbräu, a very sympathetic family business in traditional style. But it should be noted that their traditional wheat beer is better from the bottle than from the tap. Graminger Weissbier (4) on tap is soft, light and clean with a good balance of fruit, phenol and malt. It has the traditional brownish colour of rural wheat beers. The bottled version (5) is much fuller in body and has a powerful and aromatic taste of wheat malt and some chocolate. Even some hops in the aftertaste. At it’s best, you can find no better wheat beer. But there are problems with maintaining a good quality. Some bottles suffer from bacteria infections making the beer sour. Graminger Weissbier Dunkel (3) on tap is almost black. Some coffee. Not bad, but the standard beer is far better. Graminger Pils (3) is served unfiltered. Hoppy but also sulphury. Graminger Berggeist (4) is an interesting wheat bock. Soft and big with good malt but not so much wheat beer character (low bananas and phenols). After a sunrise pilgrimage to the black Madonna we left Altötting for a morning beer at Bräu im Moos in a quiet valley outside Tüssling. The brewmaster showed us the whole brewery and the museum with old brewing equipment. It was especially interesting to see the different fermenting vessels for lager and wheat beers. Bräu im Moos Hell (3) is a fresh, full-bodied Export with some hops and juicy malt. Bräu im Moos Dunkel (3) has a roasty taste of dry chocolate and coffe balancing a full body. Bräu im Moos Pils (3) is dominated by hops in both the nose and the taste, but the beer is nevertheless a little bland. Bräu im Moos helles Weissbier (3) is too thin for my taste and has too little fruit. Bräu im Moos dunkles Weissbier (3) from the bottle has a similar boring taste with very little dark character. Unertl Mühldorfer Weissbier (5), the best wheat beer you can imagine. Relatively light body. Brown and very yeasty. Clean, soft and full taste with some banana. Relatively discrete phenols. Very well balanced. This beer has a delicate complexity of unusual quality. There are fuller wheat beers, and sweeter. Many are more fruity. But only a few have the optimal balance. Erharting Export (2) on tap is thinnish and light with some sulphur. It is brewed in nearby Erharting. Unertl Mühldorfer leichte Weisse (2) is thin with a lot of diacethyl. Water is better if you are concerned about your health. In the afternoon, we made a few stops on the way to the Munich airport outside Freising. In the town of Dorfen, we visited Dorfener Stube and tasted the local Bachmayer beers. Bachmayer Hell (3) is a standard Bavarian, Carlsbergish Helles. Bachmayer Dunkel (4) is very dark and has an interesting sweet-roasty taste. Soft and malty with some chocolate. Bachmayer Festbier Dunkel (4) is also very dark and even more full-bodied with a good balance between sweetness and roasted malt. A pleasant beer. Bachmayer Pils (4) is meant to be imbibed directly from the long-necked bottle. But that would be a shame, because this beer is really good. Massive, aromatic hops dominaate the light and clean body. Is there a better Pils in southern Bavaria? Grünbacher Weisse (4) from the Schlossbrauerei brewery in nearby Grünbach. Soft, full-bodied and sweetish with a lot of bananas in the nose. One of the better wheat beers in the region. Our next stop was at Postwirt in the village of Eitting, where we tasted the local beers from the Fischerbräu brewery. Eittinger Hell (3) is light, simple and fresh with a low bitterness. Eittinger Urtyp Dunkel (4) from the bottle could be described as a modern Bavarian dark lager with a dry taste and an interesting malt aroma reminding of rye bread. Fischer’s Stiftungsbräu Pils (3) from nearby Erding – famous for it’s much larger wheat beer brewery – was also served from the bottle. Unfortunately not very fresh, but with some interesting hints of tobacco in the hop character. Our last stop was at the famous beer garden Schlossallee in Haag/Amper just north of Freising. It is regarded as a gem among friends of outdoor drinking, and we couldn’t have chosen a better place to down the last mugs of Bavarian beer. Very large and traditional with wooden tables under old trees and the possibility to buy pretzels and sausages if you don’t bring your own. The beer served is from Hofbrauhaus in Freising. Huber Weisses (5) on tap is mild, soft and very clean, dominated by a fresh banana bouquet. Low carbonation and low phenols. This beer could be the best in the lighter wheat beer style represented by breweries like Bauriedl in Eslarn, Müllerbräu in Neuötting and Schlossbrauerei Grünbach. Jägerbier (4) is a brand-name from a brewery that once operated in Haag/Amper and, of course, the most popular choice among local drinkers. It is an unfiltered version of a standard Bavarian pale lager. Plenty of wort and a higher bitterness than usual. Fresh and tasty. Hofbrauhaus Dunkel (4) was my last Bavarian beer this time. Powerful, sweetish malt aroma. A massive and well-balanced taste, totally clean. Hints of caramel but nevertheless dry. Auf wiedersehen, Bavaria!